In good condition, a very rare 18C / 19C British Royal Navy Officer's 5 Ball Spadroon. A naval officer's version of the British (copied by the French) 5 ball spadroon. This one has been shortened and sharpened to be used as a fighting sword on board a ship. 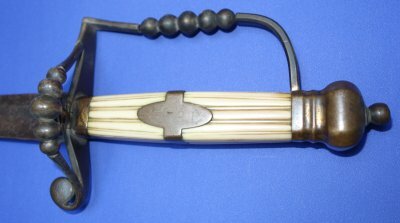 The cutting edge still sharp, the length shortened for close quarters use, the point made into a hatchet point (the preferred thrusting / piercing point prior to 1815). The 26 1/2 inch period shortened blade is in sound condition with a steady patina throughout. Blade firm in hilt. The brass hilt has bending damage, fouled anchor to guard section still present and good. 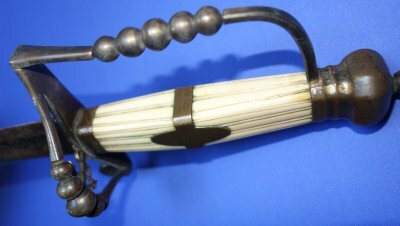 Fluted ivory grip with fouled anchor "cigar band" in good shape. 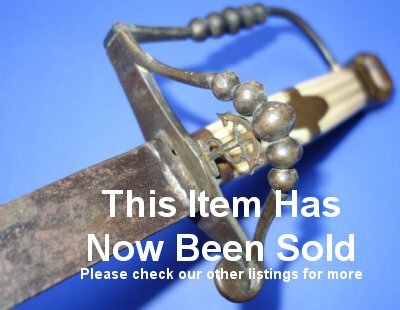 These are such very rare swords and getting one this good and evocative at only £? (too late, now sold) is a bargain, a true investment. Please quote item reference U55 (0886). Further / full sized images available upon request.